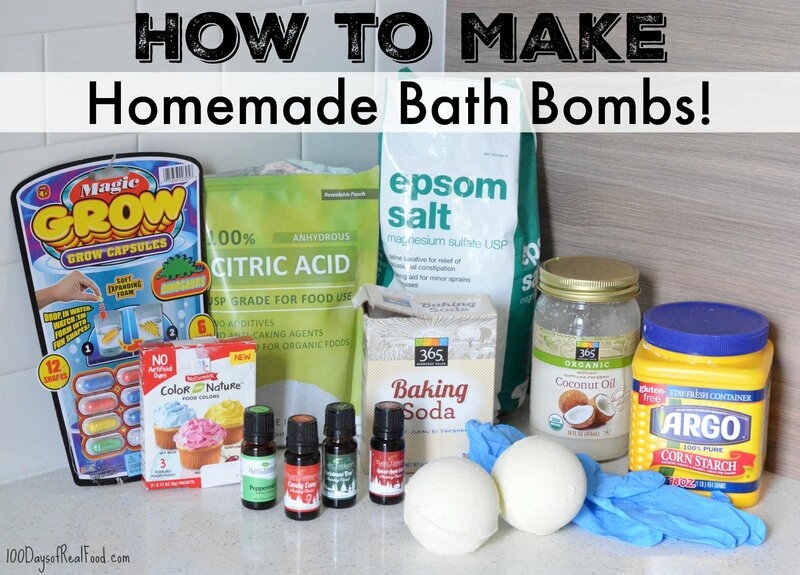 Home » Blog » How to Make Homemade Bath Bombs! Anyone with tweens can probably relate to the bath bomb craze that is currently in full swing. If you’re not already on board, bath bombs are hard-packed mixtures of dry ingredients which effervesce (fizz and bubble!) when wet. They’re an extra special treat for bath time. 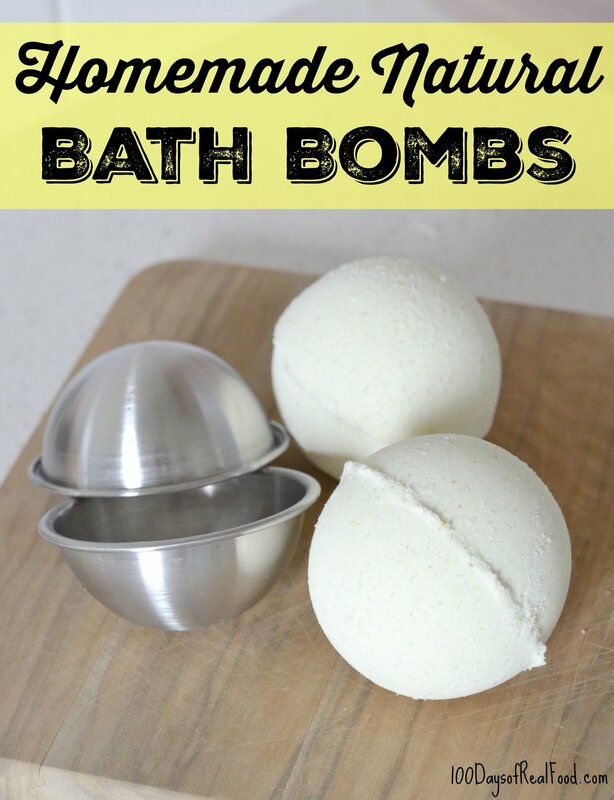 We’re most definitely fans at our house but, just like with anything, bath bombs can either be full of artificial fragrances and other unwanted ingredients or be au naturale. 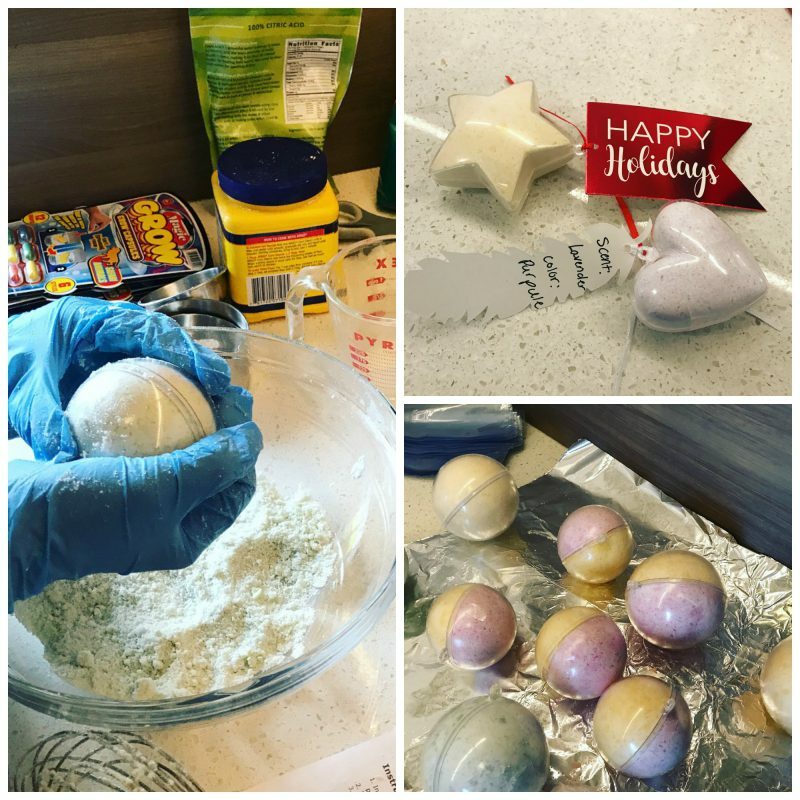 So, this holiday season, we set out to make our very own Homemade Lush Bath Bombs. And that’s because we thought they’d be a super fun DIY gift for friends and grandmas, and (the best part) – we’d know exactly what is in them! Just because we don’t want artificial fragrances (or colors) in our bath bombs doesn’t mean we don’t want any fun scents at all! So, we were excited to use some of the holiday essential oils from our lovely sponsor Plant Therapy for this project. Candy Cane bath bombs? Yes, please! Essential oils have been around for centuries and are concentrated, volatile, aromatic liquids obtained from the fruits, seeds, flowers, bark, stems, roots, leaves or other parts of plants. Plant Therapy offers only 100% pure essential oils and is one of the few companies who offer USDA Certified Organic options. All of their oils go through multiple rounds of testing and are always free from additives, adulterants and dilutions to uphold the highest quality. While you can certainly find many essential oil options out there, know that they are not all made the same, and finding a quality product is essential. Which is why Plant Therapy has been a longtime partner of ours! As a bonus, new customers can take 10% off of their first order with code 100DAYS10. A great reason to try Plant Therapy! 1/2 cup citric acid, anything acidic can damage some countertops (especially marble) so be careful! 1 teaspoon water, do not use more than this! In a large bowl whisk together the baking soda, citric acid, Epsom salt, cornstarch and (only if using) powdered food coloring. While continuously whisking, very slowly drizzle the liquid ingredients into the dry ingredients until well combined. The outcome (as pictured below) should be similar to a dry, crumbly sand and should not be a "wet" consistency. Warning: If mixture gets too wet it will activate the fizzy part of the bath bomb too soon! TIGHTLY pack the mixture into each side of the mold then press the two sides together. Ideally let it stay in the mold overnight, then lightly tap around the mold with a spoon to very carefully open and remove bath bomb. Finished product will still be somewhat fragile, so be careful! A Note about Molds and Gifting: I've read the stainless steel molds work best, so that's what we used with no problems. Bath Bombs (both homemade and store bought) can be fragile though, so we plan to transfer into same-size plastic molds for gifting. Alternatively, you can use a hair dryer on shrink wrap baggies made for the purpose of packaging bath bombs. I ordered a set that includes both options for our gifts this year. Either way, I would definitely make sure the DIY bath bombs are protected before handing them over! The number of bath bombs this recipe will make is approximate. It will depend on the size of your molds. Fun! thanks for posting this recipe. It got me motivated to make my Fizzy Bath Soak recipe! So excited to see this! My kids love bath bombs and I recently grabbed a container at the store that were red and called Rudolph noses, cute right? Both my kids got a rash from using them :( So I told them we should try making our own and then your post dropped right in to my inbox! I know what we’ll be doing over Christmas break, thanks so much! Thank you for sharing this bath bomb recipe! It looks like fun for the kids! These were a fun project. We used matcha tea powder as the coloring and it made them a pretty light green and then added a eucalyptus/lemon blend for the scent. Had some problems getting them out of the molds (even with a lot of spoon tapping) so we rubbed the molds with coconut oil before filling them and they released much more easily. These were a bit tricky to make, but once I got the hang of it, they turned out nice. I didn’t realize that you needed to knock the spoon along the seems, not the outside of the mold!We will see how they hold up once I dry them out overnight. Excited to share these as teacher gifts. My daughter is allergic to citrus, is there something else I can substitute for this? Hi there. We’ve not tried any substitutions. Why the citric acid? Just wondering if I could leave it out and still have it work. Hi there. It helps create the chemical reaction that makes the bomb fizz and dissolve. 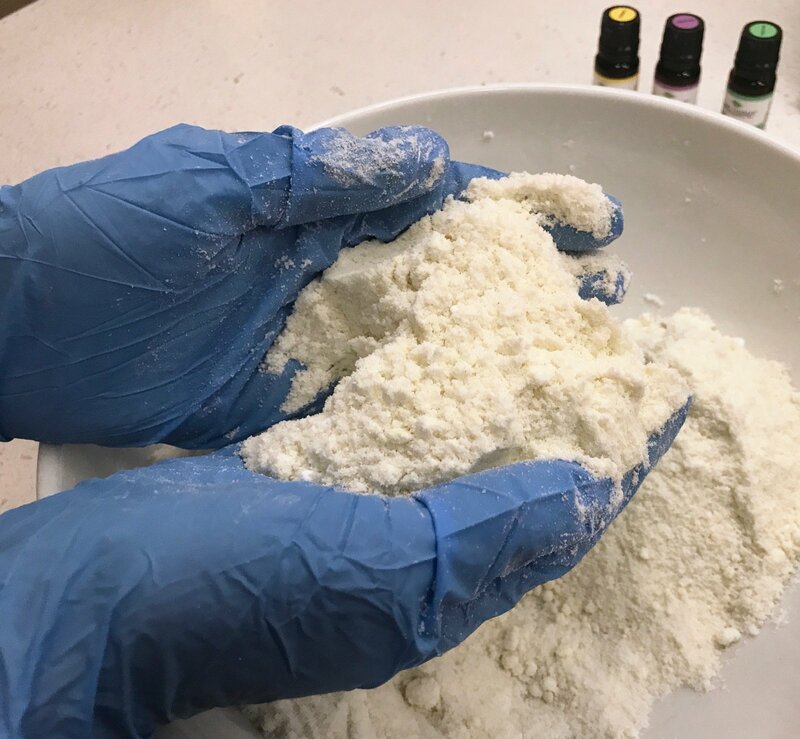 Citric acid and baking soda are the primary ingredients in all bath bombs/fizzies. The combination of the two when water hits it is what makes the fizz.. just like the volcano experiment we do with kids or in science class:) I have heard of bath bombs somehow being make without the citric acid but I’m not sure what it’s used instead, you’d have to so some research. How do you keep them from flatten out after you take them out of the molds? Any other suggestions than cornstarch? I never knew these had cornstarch in them! Plan to make some with my daughter over her spring break! Hi there. We’ve not tried other variations of this recipe. Use recipe as you normally would. Just without the cornstarch. It molds better as well. What would happen if you used liquid food coloring? Most containers of food color powder are $5+ for a single ounce of a single color. Any suggestions of a good company powder that fits a budget? Hi. It will make approximately 6 medium bombs. Do you think it would work to put them in silicone baking molds (like for candy making)? Or does it need to be able to close to pack it in better? I used a silicone mold on a different recipe yesterday. It wasn’t quite as compact as using the molds but it worked just fine and very easy to remove. My daughter has eczema. Is there a particular eczema bath bomb recipe, or would I just need to experiment with different ingredients? Do you know if adding ground oatmeal would work? Hi there. We have not made adjustments to this recipe. Let us know if you experiment and how it turns out. I have tried several recipes, but bombs never set, they turn out beautiful and smell wonderful. Best bath bomb recipe! These bath bombs have a perfect balance of fizz and silky feel. The serving calculator is especially helpful. I made these with my daughter for her classroom economy marketplace at school. We had fun making them together and they were wildly successful at school :-) We loved adding body glitter and mixing several different colors in the mold to give the bath bomb a sparkly tie-dyed look. Where can I buy molds? Amazon, you can even use Christmas ornaments that open/ close in half. Bulk apocrothy. Try calling a craft store! Hi. Lisa linked to the ones she purchased above. Here it is: https://www.amazon.com/dp/B071DJ41ZL/ref=as_li_ss_tl?tag=100drf-recipe-20&psc=1&linkCode=ll1&linkId=1da4bff1d5a65649232feff3090a2565. Does the food coloring leave any stain in the tub? I tried to make these but they were just powder coming out of the molds. It didn’t form a ball in the stainless steel ball mold. Any ideas? Hi there. Be sure you followed the recipe correctly and take careful note of Lisa’s instructions as they can be pretty fragile. 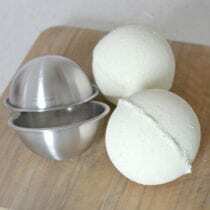 We have tried several times to make the bath bombs with the metal molds and we cannot get the bombs out of the molds. We have tried using coconut oil and mineral oil to coat the mold, but we still can’ t get them out. Any suggestions? When we do get 1/2 of one out it is very nice, but we want the whole thing. Place bath bombs in the molds into freezer for 20 mins. Take out and hold in your hand to warm the metal. The coconut oil will melt a bit and allow you to remove the bomb easily. Maybe if you put celcin wrap on the metal parts inside you can just do the same and when it’s done you can pull it right out! Also by celcin wrap, I know my spelling isn’t good but I mean the clear plastic wrap that you can put around an unfinished meal. How big are your medium size molds in diameter? I am trying to figure out how many this recipe could make using my mold. Thank you. Hi. These are the metal mold sizess: Bomb Mold Kit comes with 3 sizes – 1.8″(2 Set), 2.2″(2 Set), 2.6″(2 Set). I’ve heard about putting prizes inside, especially if you make them look like pokemon balls. Saw a kid selling those at a school store. So fun to make bath bombs! First batch didn’t dry together as a ball. Recipe seems good. We may just stick with silicone molds. LOVE THIS!!!! MY BATH BOMBS TURNED OUT A-M-A-Z-I-N-G!!!!! I followed this recipe as written, using most of the same ingredients including the dye, and ended up with crumbly bombs, ugh! We went ahead and used it as powder only to find the recipe does stain the tub! The powder still fizzed/foamed so it worked but the tub is now discolored. Yes, I used the same powderd coloring that is linked in the post. This is my go to for bath bombs. I purchased metal molds from amazon. No matter what I did I had the issue of them sticking into the containers. So I let them dry twice as long and then they come out. Anyone who is having an issue with metal models double your drying time and then take a butter knife and loosen them up gently along the rim of the molds they will start coming out. I started using ice trays for mini bombs. I use normal food coloring instead of powder and it works just as well. Is there anything I can substitute the coconut oil with?